Germaine de Staël – a woman whom Byron regarded as the most remarkable in Europe: a brilliant writer little read in England: a woman of soaring abilities and ambition, unlucky in love, hugely influential in European politics at a crucial period; rescuer of many a victim of the French Revolution; adversary of Napoleon; exile, mistress and wit. Germaine de Staël had everything except, perhaps, happiness. A Protestant and foreigner, she was mistrusted by many, especially those men and women who felt threatened by her brilliance. Born to a brilliant Swiss finance minister Jacques Necker (1732-1804) who was in turn loved and hated by Louis XVI and the Revolution, Germaine was introduced into the highest levels of Parisian society. As a girl she met Voltaire and Walpole, might have married William Pitt, and instead found herself betrothed in a marriage of political convenience to the Swedish Ambassador to Paris, Eric Magnus Staël. He was a cold, stiff man whose chief interests in Germaine were her connections and her father’s fortune. Germaine’s response to marriage was a succession of lovers. Her response to the French Revolution was to attempt to foster compromise. 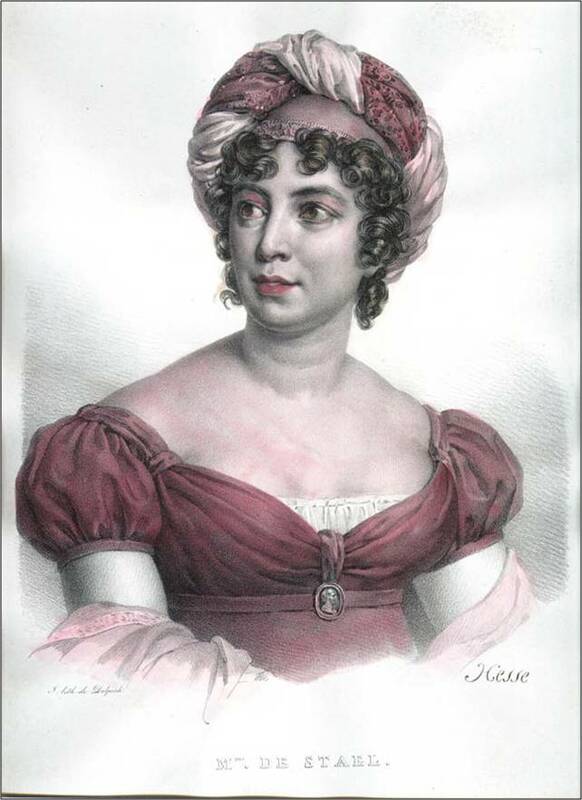 She tried to arrange Louis XVI’s escape from Paris; the new revolutionary constitution was written in her house. She wrote influentially on history and politics, on Rousseau and on suicide (her intense, over-pushy mother bequeathed her a strong sense of morbidity); she was exiled to her chateau at Coppet in Switzerland by Robespierre and by Napoleon, who detested her open attacks on him. She travelled widely, met everyone of importance in a continent at war, and lived long enough to see the restoration of the Bourbon monarchy. Scientific progress makes moral progress a necessity; for if man’s power is increased, the checks that restrain him from abusing it must be strengthened. I have never known a woman who was more continuously exacting…. Everybody’s entire existence, every hour, every minute for years on end, must be at her disposition, or else there is an explosion like all thunderstorms and earthquakes put together. Staël is a genius, an extraordinary eccentric woman in everything she says or does. She sleeps only a few hours, and for the rest of the time she is uninterruptedly and fearfully busy…. Whilst her hair is being done, while she breakfasts, in fact for a third of the day, she writes. She has not sufficient quiet to look over what she has written. The sciences have always owed their origin to some great spirit. [Adam] Smith created political economy; Linnaeus, botany; Lavoisier, chemistry; and Madame de Staël has, in like manner, created the art of analysing the spirit of nations and the springs which move them. Nature and Society have disinherited one half of mankind; strength, courage, genius, independence, all belongs to men: the laws of morality itself, according to the opinion of an unjust society, seem suspended in the relations between men and women; .. they [men] can have received from a woman the favours, the tokens of devotion which would bind together two masculine friends, two companions in arms and which would dishonour one of them if he were to prove capable of forgetting these; [yet] they have received the same from a woman, and extricate themselves from everything..
1790 G has a son by Narbonne. Publishes Sophie and Jane Grey. 1817 G. dies in Paris.